Jobs And The Sequester | On Point with Tom Ashbrook, April 8, 2013. “Can we save Social Security?,” Melissa Harris-Perry Show, February 19, 2012. “Debating Obama’s Vision for the U.S. Economy,” PBS Newshour, January 25, 2012. 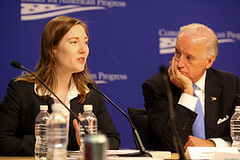 “Economic Recovery Stumbles, Reviving Debate on Way Forward,” PBS Newshour, June 2, 2011. “Assessing the Implications of a Shutdown.” The Ed Show. MSNBC, April 7, 2011. “Who Would Benefit from Extending Bush-Era Tax Cuts?” PBS Newshour, September 9, 2010.